I work in a school system. We’re paid monthly, on the last day. It takes discipline to budget a household in a single income where the wages come 28-31 days apart. In December we go on Christmas vacation a few days before the holiday and return in the first week of January. It’s about a two week break, something everyone looks forward to since we began school in early August. We all need one by then! As a kindness, the payroll system works in feverish activity and closes payroll early so we can get paid before Christmas instead of the week after, as the usual rotation would have been. That’s the plus. The minus is that it’s 50 days in between paychecks. Our wages don’t come for about 6 weeks and it’s a veeeeeeery long stretch between mid December and the last day of January. It takes a lot of patience to wait calmly and in disciplined manner for that paycheck in January. We all look forward to our wages, whether they come on the day we worked, or the week’s end or the month’s end. When we receive that envelope, or open our bank account to view the Direct Deposit, we feel gratitude, pride in our work, and relief. For the unsaved world, including the false Christians who think they are saved but aren’t, the spiritual wages they will receive on their last day will come as a shock. The wages for the sinner have a very long delay, but on their last day they will receive a fat envelope containing a list of all their misdeeds and sins. Their wages will be toted up at the bottom and it will say $DEATH$. 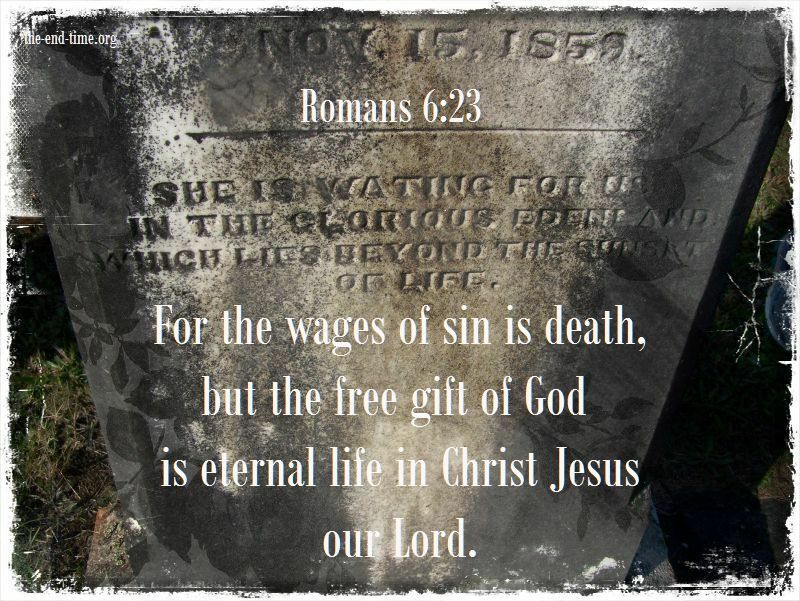 Why is this Romans 6:23 verse an encouragement to me? Deep in sin, Jesus lifted me from the muck, cleansed me with His blood, and gave me eternal life. I accumulated an eternal debt of wages upon wages for all the evil work I had performed before I was saved. I deserve death. He gave me life. Hallelujah! Praise Him to the Highest. The babe has come, the boy will grow in wisdom and stature, the Man will die, the King will reign! And Jesus increased in wisdom and in stature and in favor with God and man. (Luke 2:52).